If you find yourself in Australia at the end of February, Ballarat - in central Victoria - is the place to be. 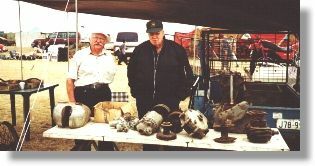 The Great Southern Swap Meet is a mecca for vehicle enthusiasts, and each year thousands come to pore over the two thousand sites. Well, two thousand-ish. Although many are not of interest to the vintage bike enthusiast, that occasional find "somewhere out in the car section" means lots of walking during the weekend. My favourite "car section" find was a c1923 shaft drive FN gearbox, which the vendor thought "might come out of a Morgan car". Forty dollars seemed the right price. There is usually a smattering of complete bikes, from veteran through to modern, to choose from. Probably the pick of this year's crop was a very original 1914 Triumph, which could be had either in its single speed form, or with a Sturmey Archer 3-speed hub to suit. 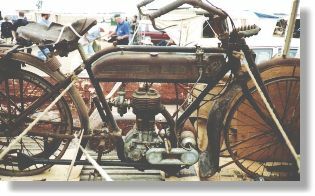 Although original and complete (yes, in 1914 you could have the B&B carb in place of the usual double-barrel Triumph device) it was probably just a little way past the "wipe-over-with-the-oily-rag" category, but would restore beautifully. 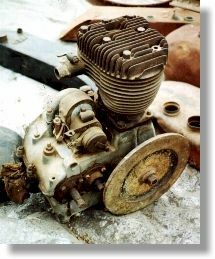 I did my usual scrounge for FN and Rudge bits, and spotted one or two curiosities like this FN motor from a 350 cc M70. Introduced for the 1927 season, the M70 was FN's first real mass production machine, with around 40,000 units produced in various forms through until 1946. The three-speed box is integral with the motor.